The sharp eyed will notice that not only does the ordinate (the y axis to the unmathed) but also the abscissa (the x axis) has changed. The latter, because the graph since it's inception in 2012 only extended to 2015. 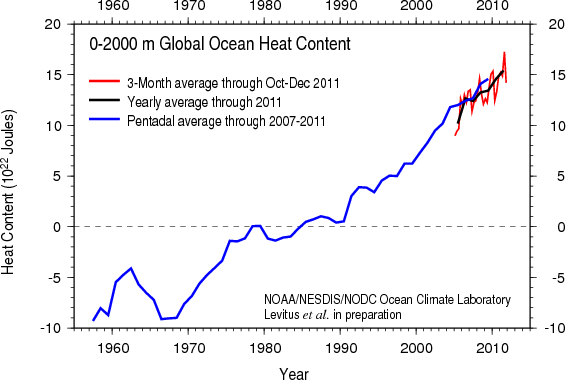 The former, well, the former because the ocean heat content has increased an awful lot and it went off scale, well above what was anticipated when it was first introduced in February of 2012. The interesting question is whether the ordinate was increased enough, or this graph is going to break in ~2018 or so if the current trend continues or even speeds up. As this went on everybunny seemed confused, that the article was written by John Abraham and who knows who wrote the headline and NOAA had not changed the limits of the graph until this month and why. Eli found the entire exercise rather looking glass. It would be more instructive, if less dramatic, to convert these heat content rises to average temperature changes. @metzomagic - Maybe. Averaged over the whole ocean, the heat added since 1960 is 3 x 10^23 J in about 1.4 x 10^24 g, or about half a J/g. That's enough to warm the ocean by about 0.1 C - I don't mean to minimize this but it will take a while at this rate to boil the oceans. Nonetheless, the effects on climate and ocean life can be large. So would you want to see really small numbers, 1E-1 C, or really large numbers, 5E22 J (because they both are there for anyone to see)? Personally, I really don't care how they plot the data. Now, if Abraham's chart breaking headline were to appear as a full page one exclusive in print, that wouldn't bother me either, but as to the general public, I'm pretty sure they all would say WTF? But, we're talking about the 97% blog. Climate scientists (or anyone else) calling 97% blog headline silly, doesn't bother me either. There were many reasons to find that Twitter discussion frustrating and I mainly stayed out of it (apart from pointing out that a Tweet by Doug McNeall that appeared conciliatory, probably wasn't). Something that I found particularly frustrating, though, is that there are some who were involved who have a habit of implying (sometimes not even implying) that the views of actual climate scientists are all that matters. When the infamous dinner was criticised, it didn't matter because it was only bloggers. That most of those bloggers were professional scientists, and some were climate scientists or ex-climate scientists, didn't seem to matter. Even in this exchange there was a definite sense that they see the communication attempts by others as getting in their way and interfering with what they're doing; as if being climate scientists means that they're in some special place where they get to communicate without criticism, while feeling entitled to criticise what's being done by others. I don't have a real problem with them expressing their views. They have as much right as anyone else to do so. It might be nice if they realised that that applies to others too. It might also be worthwhile them recognising that criticising someone for appearing to be using climate science for political ends is - itself - fundamentally political, just as arguing against advocacy is a form of advocacy. I think the headline is bs. But those guys have to make eye catching headlines. This brings readers and increases clicks on their advertisements. "Scientist increases graph scales to account for increasing ocean heat content and passage of time". The propaganda wars are so much fun...you should read what's being written about the Venezuelan dictatorship. Graham, referring to the venezuelan dictatorship isn't trolling. It's propaganda. I used it as a contrarian example to show how these things work. I could have been even more daring and referred to the "Israeli Theocracy". But I really like to stay below the radar. If you think it's trolling then you must be a very strong supporter of the Maduro regime. Your handle tells me you are probably a confused leftist Anglo. This explains your reaction. If you wish to learn a little bit about what goes on in venezuela, let me know. So you're equating an article with a possibly silly, but clearly catchy, title with propaganda. So, what you're proposing is that journalists should use the most boring titles as possible and should, under no circumstances, use a factually correct, but possibly silly, title even if it could increase readership? That seems rather silly to me, but YMMV. Fernando, a lot of people who aren't actually resident in the UK don't realise that the entire place is an anarcho-syndicalist commune. Extreme leftism is compulsory, in a non-hierarchical, consensual sort of way. Of course you'll never read that in the MSM, apart from Fox, maybe. Has not Judy weighed in on the rescaling? I was a bit taken aback how seriously some people took the criticism. As you say, scientists have got very right to comment on science journalism, but I John and I were very clear that we only thought that it was silly, not that the story itself was wrong. However, it got quite interesting when the headline was justified on the grounds of increasing blog traffic - although actually, maybe our controversy on twitter that helped drive the traffic ?! ;) I actually thought it was quite good to talk it through, even though it did get a bit heated. It's exactly the kind of conversation that scientist would have at a conference, only this time it happened to be out in the open and others started piling in. It's healthy for science (and the way it is communicated) to be put under the microscope by its own community. BTW Eli, I never thought Dana was responsible for it - I always knew John Abraham wrote the article. Dana came in to the conversation to defend it, that's all. Richard, a lot of people lost the thread. Graham, Eli understands there are many no go zones for those who deny mankind's role in changing the climate. These tend to be centered around universities in small towns such as Oxford, Cambridge, Reading, etc. Pig, you are assuming that ocean temperatures are uniform and warm uniformly. Not so. I was equally surprised by the discussion, but not just by how some took the criticism. I was more surprised by what some were willing to say while criticising. Although it is good to talk these things through, I'm not convinced that the outcome was positive. I find the whole issue with the headline a little strange in that it was a newspaper article, and so the headline was designed to attract readers. Complaining because it was factually correct, but silly, seems unnecessary if it achieved the goal of getting more to read the article. I'm much more concerned with headlines and articles that are wrong, than those that are silly. "I'm much more concerned with headlines and articles that are wrong, than those that are silly." Your concern is well placed. "The oceans are warming so fast, they keep breaking scientists' charts"
Comments there have pretty much petered out. "Climategate, the sequel: How we are STILL being tricked with flawed data on global warming"
Comments there have started (? people over there are just now waking up + tomorrow's possible daytime surge) to peter out, so, for the sake of argument, let's say that comment thread petered out ~4000 comments. That's an order of magnitude difference. IMHO, two orders of magnitude (one order to get to 50:50 another order to get to 10:1) of magnitude in the wrong direction. Perhaps even three orders of magnitude (can't forget the 97% noncensus). IMHO, the slapshot lies appear to be working much better than slow boring truth (current actual global warming on the timescale of humans). Actually Eli, I'm quite aware of the fact that heating is pretty non-uniform. I averaged over the whole ocean for simplicity, even though the measurements, in the top 2000 m are less than half of the whole ocean. Averaged over the measurement volume, the temperature change is roughly twice as great, about 0.2 C. Naturally temperature changes are much greater some places. Another way of thinking about the stored energy is to compare it to that released in a tropical cyclone, typically a few times 10^20 J. Viewed thru that lens, the energy stored since 1960, about 3 x 10^23 J, is enough to power a thousand or so tropical cyclones. Was there this kind of pushback when Australia added a color to their temperature scale? Of course the headline is silly, but did Abraham present it as being this really incredible new phenomenon that exaggerated the actual facts? I kind of take it as a spoof on all the ridiculous articles I have read where the fraud of ACC has been PROVEN and the house of cards is on the verge of tumbling down. It just seems to me to be fun to throw that back in their faces. Richard, there was 'piling on' because people who the criticism were not intended to see, saw it and participated? Eli, the 'low-level' people jumped in? Both of you think you are at a different and higher level? The OHC 3-month average took a jump in 2012 and has remained more or less at the same 'high' level (~20). It was already scraping the top of the graph. AS you note, the x-axis was at 2015 anyway. In other words, *nothing dramatic happened*. The story was bogus, wasn't it? 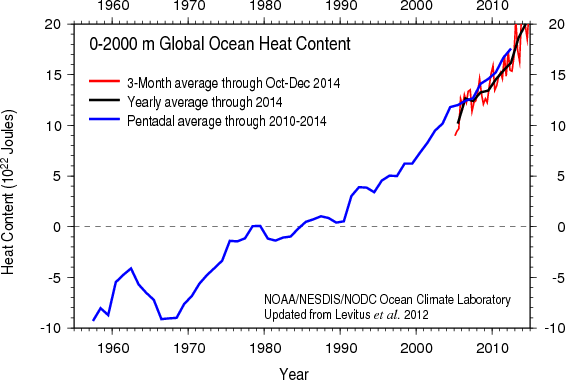 Just more 'piling on' on the '2014 highest ever' bandwagon? The article contained no information apart from the graph scraping, . It contained links to two of Abraham's papers - salesmanship. Go back and look at the history of 'communication' of claims of this sort. The same over-dramatizing structure is used: highest this, longest that, worst ever etc, etc. It doesn't work, it doesn't communicate anything. It sets up environmental science for falls. Even at best, people roll their eyes and move on, and those who internalize a vague sense of urgency, dread and 'awareness' (which is the objective) become prime susceptible targets for uncomfortable questions. True believing recent converts never convince anyone else and can be reconverted in a flash. The IAC reviewed and found the IPCC to be in the habit of making dramatic-sounding but redundant claims of no substance. Abraham's chart-busting falls in the same category - the supposed threshold crossing is artificial, and meaningless, but yet literally true. Don't employ carnival barker techniques. I think it's great to remind people that while there is (far too) much chatter about the "pause", energy is continuing to accumulate rapidly in the oceans. This is especially true as so much effort by contrarians and political liars has gone into crying up the "pause" as evidence that AGW is wrong or sensitivity is low or other such policy-paralysing tripe. Everett F Sargent, comments and readers are only weakly correlated. The more scientific my posts are, the less comments I get. If there is nothing wrong with a post, people see no need to comment. A way to get many comments is to get some comments by mitigation skeptics. It is easy and rewarding to show them wrong. Thus that a factually correct post by Abraham gets less comments than utter nonsense by Booker could also be explained by the quality of the article. Just to clarify, the tweet at the bottom between Things real and myself is related to Dana's article on Matt Ridley, not about the article in this blogpost.